This one is nice, lots of options and brutal game play. I died many times without knowing what struck me and the the fixed obstacles are difficult to destroy while still gunning for the moving baddies..
At the end of my game it prompted to continue with 3 credits remaining, I didn't continue but what is the comp ruling on this? IMO continues are a no-no. Agreed, plus I read through the instructions and it says score gets reset to zero on continue so no advantage other than doing practice runs on that level. Last edited by KarateEd on Tue Oct 09, 2018 5:08 pm, edited 1 time in total. I think if you see game play from other machines, there are bullets or spheres coming from some of the fixed objects. That may be what are taking your ship down. I've had it happen to me but it happens so fast I can't tell exactly what happened. And yes, you are using the settings we should all be using for this game. They are the default. 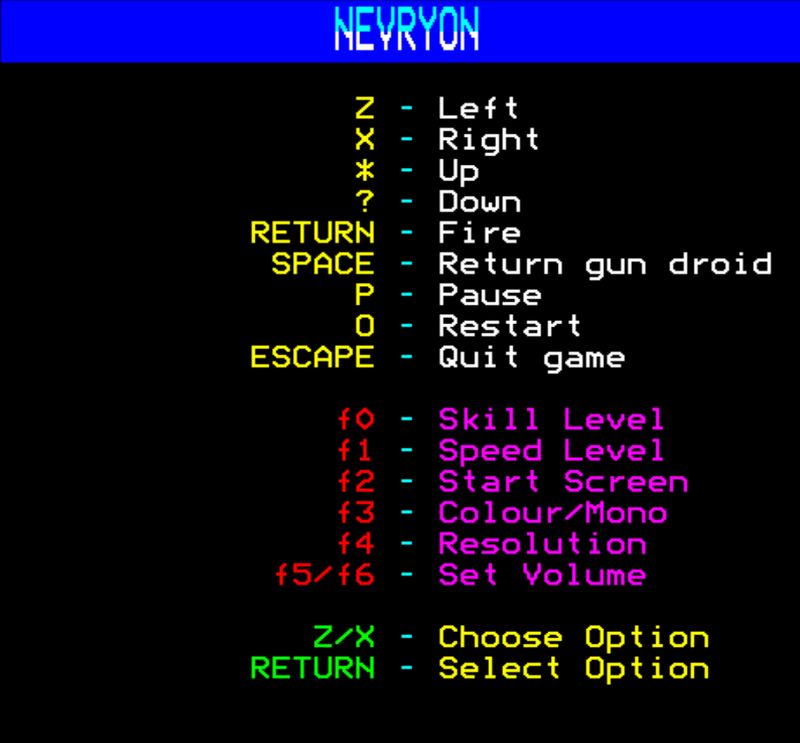 It doesn't say clearly how to start the game but 3 space bars then and enter at the 'ship' screen and you then need one more space bar when it prompts you. Last edited by KarateEd on Tue Oct 09, 2018 5:44 pm, edited 1 time in total. I also tried HI-RES which seems a little less jerky, but it might just be that things move in smaller chunks. I keep dying within the same few pixels, just where the gun on the floor fires round blobs diagonally at you. loved the BITD, one of my favs! Level 2 is hectic! Haven't worked out a good pattern yet, however one tip is that if you have to fly through an obstacle do it fast to lose less energy bars. This score was on 'hi-res' mode which appears to be mode 2 screen at half width. Last edited by KarateEd on Fri Oct 12, 2018 6:01 am, edited 1 time in total. I got all the way through level 1 on my first ship and then didn't get much further. I do find the collision rather annoying, bullets hitting you that don't actually collide and not picking up power-ups, even though you fligh straight through them. I think HI-Res is mode 1, with low res being mode 5. Last edited by FourthStone on Sat Oct 13, 2018 8:19 pm, edited 2 times in total. The only way I seem able to get a higher score is to get to the end of level 1 and die intentionally which seems counter to the rules but reminds me of Wouter's idea that any way to get a high score should be permissible without actual cheating like hax and the like. Otherwise I am at a standstill with this game as getting through the first level without losing a life is straightforward but then level 2 seems actually impossible to me at this time no matter how many attempts tried. I hear ya FourthStone.... my high score came because I was inept at getting through the first level pretty nearly every time. I'd lost so much 'life force' that a single bullet would get me. Once I got 'into the zone', high scores went out the window,. I'm now unable to improve on my score at all because of the same reason you give. I can fairly easily get through level one now, usually within the first 3 attempts but once I hit level 2, it's all over, very little score improvement. This is one of those games where when you succeed, you do worse score-wise. It's a tough one for sure. I totally understand why that seems to be the solution but I think it affects so few games that allowing it for the ones that need it could spoil otherwise fine games. In this instance if we allowed killing yourself intentionally at the end of level one then everyone would do it and we'd all have the same score so it's equally pointless. The problem isn't with the competition format or the rules - it is that the game isn't suited to competitive play due to the difficulty of later levels. At least we know to not allow this game in future if it's really that bad. Edit: This is probably why it has 'Continues', the software house realised it was too difficult so had them put in so people could see more of the game. Last edited by sydney on Fri Oct 19, 2018 5:34 pm, edited 1 time in total. I had a few practice runs on level 2 and somehow managed to make it through, then had a proper run and made it to level 3 with 2 lives... maybe on a super lucky run further progress could be made... too many tries for today though.